The Kariba Chair is a delightful and versatile chair suitable for use in the dining room, office, patio or as a casual chair anywhere! The webbed seat version is VERY comfortable with the webbing giving perfect support. The webbing is available in a range of colours. 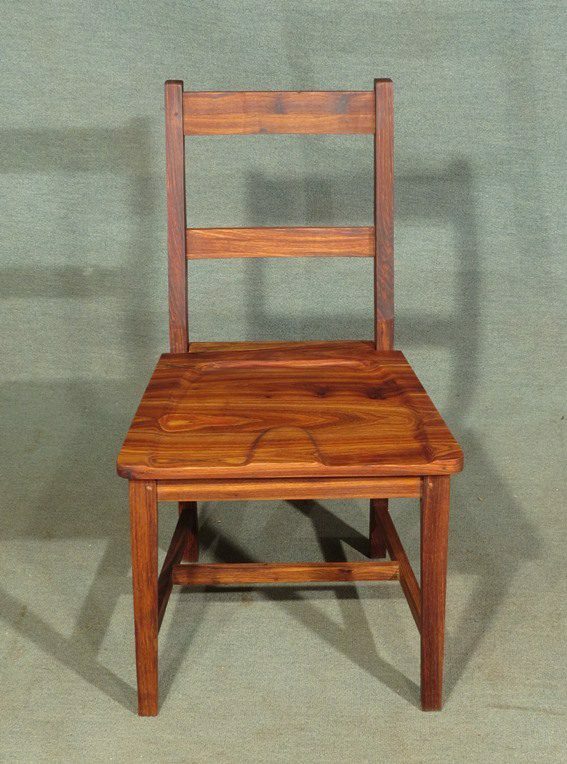 If built from African Bloodwood (a.k.a. mukwa or kiaat and the lightest version) it is a light, robust chair ideal for use in restaurants and other commercial applications. The Kariba chair can also be built with solid, upholstered or riempie seats. The design of the Kariba chair is based on a traditional African settler farmhouse chair – a simple but rugged and comfortable chair that was practical to produce with the basic tools available to pioneer craftsmen. The Kariba Chair ruggedly built with very accurate mortice and tenon joints, reinforced by large, secure corner blocks, and strong stretches between the legs. As such it is eminently suited to the heavy duty commercial use of restaurants, large events and so on. Your Kariba Chair will be carefully packed in a double walled cardboard crate, 2 to a crate, padded with air-o-thene foam. Packed Sizes: Weight for Bloodwood chairs. Ordering and delivery: glove delivery can be arranged in South Africa, Botswana, Zambia and Zimbabwe. As each table we make is carefully handcrafted and hand finished to order, please allow four weeks for manufacture, and two to four weeks for delivery from the time of order.